If you're reading the ingredient list on the food you eat, you may notice a host of ingredients -- such as sodium nitrate -- that don't sound like something in your kitchen cupboard. This food additive is used to add flavor and color and to prolong the shelf life of food. While sodium nitrate has come under fire due to a possible connection to cancer, the U.S. Department of Agriculture has approved its use in food. Sodium nitrate is a natural salt made up of sodium, nitrogen and oxygen. It's used in meats not only to enhance flavor and add color, but also as a preservative to prevent bacterial growth and spoilage. Some of these bacteria can be dangerous, such as Clostridium botulinum and Listeria monocytogenes, which cause potentially serious diseases. This food additive is considered safe, according to Authority Nutrition. But when sodium nitrate interacts with bacteria in meat, it changes chemically, loses one oxygen and becomes sodium nitrite. With time, sodium nitrate can form either nitric oxide, which is a gas, or nitrosamines, which are chemicals known to be carcinogenic to animals. Due to the cancer concerns surrounding notrosamines, the USDA limits the amount of sodium nitrate in meats -- no more than 500 parts per million -- and requires that these foods contain added vitamin C, which helps prevent the formation of nitrosamine. Sodium nitrate isn't used in many foods, according to the American Meat Institute, and you're more likely to find sodium nitrite, one of the compounds formed spontaneously from sodium nitrate. However, natural sodium nitrate is still used in dry cured meats and meats made in specialty shops. 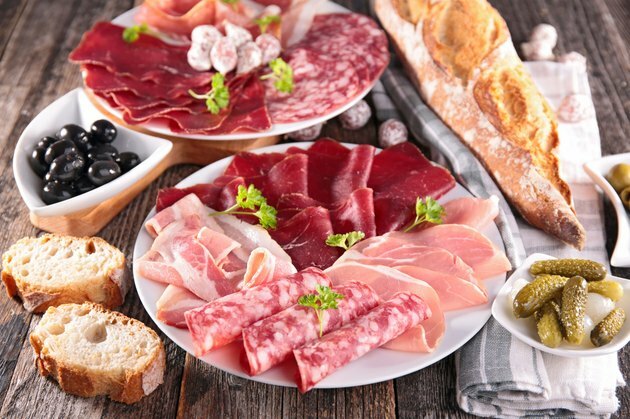 Examples of these types of meats include prosciutto, capicola, salami, pancetta and lardo. If you're eating these meats, read the ingredients list to see if it contains the food additive. You can also ask the butcher or maker of the meat for information about the preservative content. Cured meats aren't the only source of sodium nitrates. In fact, less than 5 percent of your intake comes from cured meats, according to the American Meat Institute. The majority of the nitrates in your diet come from those naturally found in vegetables, which form sodium nitrate from nitrogen in the soil. Spinach, for example, has 741 milligrams of nitrates in a 3.5-ounce serving, while the same serving size of bacon has 5.5 milligrams. Other veggies high in the salt include mustard greens, coleslaw and broccoli. Mixed greens, tomatoes and vegetable soup are also a source of nitrates. Certain fruits, including bananas, applesauce and oranges, also contain small amounts. The Environmental Protection Agency recommends daily sodium nitrate intake be limited to 7 milligrams of nitrate ion per kilogram of body weight, or 477 milligrams for a 150-pound person, with weight in pounds divided by 2.2 to determine kilograms of body weight. Eating small amounts of processed meat every day, as little as 2 ounces, increases your risk of colorectal cancer, according to the American Cancer Society. While the connection between processed meats and cancer isn't clear, nitrites and nitrates are currently being investigated as a possible factor. It's OK to eat processed meats such as hot dogs or salami on occasion, but the American Institute for Cancer Research suggests you replace these meats with healthier choices such as fresh chicken or fish, vegetarian versions of these meats or beans. It also important to remember that veggies, which also have many health benefits, may be your primary source of sodium nitrate. Nitrates in the food you eat convert to the gas nitric oxide in your body, which promotes proper functioning of your vascular system. Nitric oxide may also reduce inflammation and offer some protection against cancer. If you're concerned about nitrates in your diet and risk of cancer, consult your doctor for guidance. Authority Nutrition: Are Nitrates and Nitrites in Foods Harmful? Food Safety News: Cured Meat Is In, But Is it Safe? Agency for Toxic Substances and Disease Registry: Nitrate/Nitrite Toxicity -- What Are U.S. Standards and Regulations for Nitrates and Nitrites Exposure?